During the workshop we will be building a rubble trench and rock foundation for a new cabin that we will be building. We will also get to work on building wattle and daub walls for this cabin, and add natural earthen and lime plasters over these finished walls, including adding several clay-based paints. Additionally, we will be building a cob oven and earth bag sofa at the home of a local family that receives tourist groups. Lastly, we will be building a small rocket mass heater inside the new cabin. 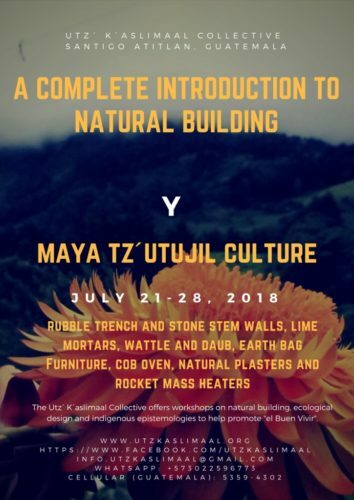 This complete natural building workshop will introduce you to several different and varied natural building techniques and is the perfect way to either begin your learning journey related to natural building or further develop your natural building skills. We offer private transportation from the Guatemalan airport to Santiago Atitlan and vice versa. Lodging options include comfortable local hotels or home stays with local families. Included in the price of the workshop is a day-long tour of several communities around Lake Atitlan to experience and learn about other types of natural construction. Also, participants will have the opportunity to participate in several recreational and cultural activities during the evenings to learn more about the unique culture and history of the Tz´utujil people. Each day of the workshop will offer a mix of classroom style conceptual/theoretical instruction in the mornings and several hours of practice with the different natural building methodologies that we´ll be using. We will also have the opportunity to visit several naturally built structures around the Lake and process what we´ve been learning at the end of each day. Each participant will receive a booklet with information on the natural building methods that we´ll be covering and electronic copies of several leading books in the natural building niche. Community lodging in Santiago Atitlan’s famous lakeside hotel, Posada de Santiago <http://www.posadadesantiago.com/lodging.php>, which includes the use of its beautiful campus, a jacuzzi, heated pool, bicycles, and canoes/kayaks. Private lodging in a clean and comfortable local hostel, or a homestay with a friendly indigenous family.